The term "recent" is used throughout the paper to describe the IBD results, but as far as I can see there's no mention of any dates. Based on the data in the very thorough Ralph and Coop European IBD study (see here), I'd say that segments of over 1.5cM represent gene flow from well within the past 5,000 years. If this assumption is correct, then the results certainly make a lot of sense. That's because there were well documented historical events that could account for the main outcomes in the figure below: a) low level IBD sharing between Sub-Saharan Africa and much of Southern Europe; b) inflated IBD sharing between North Africa and Southwestern Europe; and c) inflated IBD sharing between Southeastern Europe and the Near East. I probably don't need to discus in detail what these events might have been. Suffice it to say that the Mediterranean Basin has seen several major empires which facilitated regular population movements between Southern Europe, North Africa and the Near East. This process included the slave trade, which was one of the main economic activities in the region for a couple thousand years. It's important to note, however, that fastIBD doesn't specify the direction of gene flow. In other words, shared IBD segments can be the result of our ancestors either receiving or giving admixture, or gene flow from a third party. But as Botigué et al. point out, the North African samples which show the highest IBD sharing with Iberians are also those with the lowest European ancestry proportions in the ADMIXTURE analysis (see below). Therefore, it's unlikely that this shared IBD is of European origin in any significant degree. Key: Canis - Canary Islands; And - Andalusia; Gal - Galicia; Bas - Basques; Spa - Spain; Por - Portugal; Fra - France; Ita - Italy; Tsi - Tuscany; Gre - Greece ; ItaJ - Italian Jews; AshJ - Ashkenazi Jews; Qat - Qatar; NMor - North Morocco; SMor - South Morocco; OccS - Saharawi; Alg - Algeria; Tun - Tunisia; Lib - Libya; Egy - Egypt; Yri - Yoruba from Nigeria; Mkk - Maasai from Kenya. There's also a PCA in the supplementary PDF which further underlines that most of the IBD sharing between Europe and North Africa, as well as Qatar, is not of European origin, because it creates significant substructures within the European sample. Unfortunately the Qataris are the only Near Eastern sample used in the study. Then again, if I was to pick a single ethnic group to represent the Near East in an IBD study like this, then Qataris would probably be near the top of the list. That's because they've been affected by population movements from other parts of the Arabian Peninsula and also Persia, but at the same time never experienced significant gene flow from Europe. More information about the genome-wide genetic ancestry of Qataris is available in this recent open-access paper by Omberg et al. Botigué et al. also make some interesting comments about Jewish genetic ancestry in Europe. The quote below comes from the supplementary PDF. Another possible hypothesis to explain the increased diversity in southern Europe is that an influx of Jewish ancestry had a heterogeneous effect on genetic diversity in Europe. However, in most European populations here, virtually no Jewish ancestry was detected. On average, 1% of Jewish ancestry is found in Tuscan HapMap population and Italian Swiss, as well as Greeks and Cypriots. This may reflect the higher sharing with Near Eastern populations in the Italian peninsula and southeastern Europe (Fig. 2C) or low levels of gene flow with the early Italian Jewish communities (6). Estimates from the IBD analysis are in agreement with ADMIXTURE estimates that the amount of sharing between these populations is extremely low (SI Appendix, Table S3). Specifically, results of IBD sharing between southwestern Europe and North Africa are two orders of magnitude greater than those found between the same region and Jews, the average WEA for southern Europe and North Africa is 203, while for southwestern Europe and European Jews is 1.3. 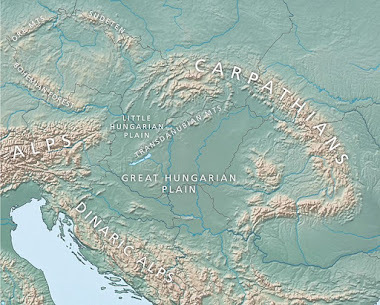 The IBD maps are erroneous, as northern West Asia (Cypriots are a peculiar island population), the Caucasus and the Pontic steppe region are not represented. Cypriots are very similar to nearby populations in Lebanon and Turkey, except they lack the recent East Eurasian admixture seen in Turkey. I'd say the levels of Near Eastern, North African and Sub-Saharan IBD across the East Mediterranean would be very similar to those in Cyprus. I'm sure we'll see such data very soon. But as Botigué et al. point out, the North African samples which show the highest IBD sharing with Iberians are also those with the lowest European ancestry proportions in the ADMIXTURE analysis (see below). Therefore, it's unlikely that this shared IBD is of European origin in any significant degree. Presumably, the North African populations with the putatively European component, i.e. N Morocco and Algeria (Egypt being a rather separate case), do have a signal reflecting IBD with Europe, but not so strong (or else it is questionable as to how they would have this European component). So we would be looking at a situation, effectively where populations would flow into Iberia from, Tunisia (?) and out from Iberia to Morocco, but not into Iberia from Morocco and out into Tunisia from Iberia. With Iberia-Morocco flow being less pronounced than the Tunisia-Iberia flow. Genetic analyses show that Cypriots have more southern West Asian and more African genetic influence than Anatolian Greeks, Turks, Armenians and Assyrians. But Cypriots also have an Aegean genetic influence that is elevated by West Asian standards. In short, Cypriots, as is common for island populations, have a peculiar genetic profile and are not a good proxy for any part of West Asia other than Cyprus. As for the Cypriot-Lebanese comparison, the Lebanese, even excluding the Muslim ones, carry more southern West Asian and more African genetic influence than Cypriots. Also the elevated Aegean genetic influence in Cypriots shows up there again. Moroccans and Algerians do have European ancestry, but most of it is probably older than 4,000 years, so it won't show up in an IBD analysis with a threshold of 1.5cM. But it does show up clearly in the ADMIXTURE analysis. By the way, I've added a PCA based on the IBD data from the supplementary PDF to further underline the likely direction of gene flows. It's a bit confusing because, on one side, as you say, there is no clear time estimate for the IBD data, so it could be your own of 5000 years but it could also be anything else. How can we know if at all? On the other side the term "Near Eastern" here seems to mean more Egypt and Arabia (Qatar) than what we usually understand by Near East (Turkey, the Levant, Iraq, Iran...), so we should be particularly cautious about that. I wonder why the authors decided that "Near East" should be measured with Egyptian and Qatari and not Turkish and Syrian references, for example: it really goes against common sense, more so as we know that West Asia has two overlapping but distinct components (these populations would belong to the less important one). Also the ADMIXTURE algorithm doesn't go deep enough (K=6 but two clusters are captured by hyper-endogamous populations, so it's more like K=4), not showing for example intra-European differences, which should be important in order to properly estimate admixture. For example I find the "Qatari" component in Iberians to be way too large: this should vanish (or be largely reduced) if we consider intra-European differences, what surely requires deeper K analysis. You can't estimate admixture in Iberians without first locating the (well known to exist) Iberian-specific component, which should be the base against which the contrast is made. So not a good analysis IMO. The threshold for the IBD detection was set at >1.5cM. Such segments are unlikely to be older than 5,000 years, apart from a minority of false positives. Also, it's not just the cM that tells us this, but the fact that this haplotype sharing between Europe and North Africa and the Near East creates significant substructures within the European sample. If it was the result of Neolithic gene flow into Europe, and/or European admixture in Qatar, then we wouldn't see such sharp differences between the results for Greece, or even Cyprus, and nearby populations to the north and northwest. Check out the PCA I posted above based on the IBD data. Indeed, we know from ancient DNA that there were population movements from the Mediterranean to Central and Northern Europe, including Scandinavia, around 5,000 years ago. These migrations would've spread the North African and Near Eastern IBD up to the North and Baltic seas, and I suppose evened it out a bit across Europe, if this IBD was present in Southern Europe >5,000 YBP, but this didn't happen. By the way, Egypt wasn't used to measure Near Eastern IBD in Europe, just Qatar. Egypt was lumped in with North Africa. I think Qatar really isn't a bad sample in this context because it's far away from Europe, but at the same time had close ties to other parts of the Arab world and also to Persia. If you look at the Omberg et al. 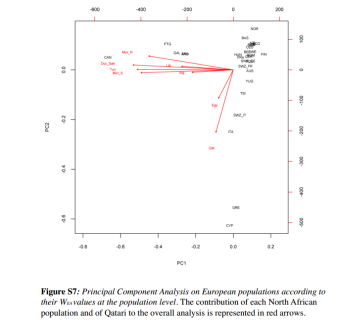 study I linked to above, it shows that this same Qatari sample carries genetic substructures present in the Levant and Pakistan - in other words, southwest and south central Asia, respectively. So it has decent coverage of that part of the world. This study can be criticized for a lack of samples, and using low samples from many regions, but surely we're used to that by now? I reckon the authors did well with the samples they had available. and don't see how they didn't prove their case that there's recent (<5000 YBP) North African and also Near Eastern admixture in Europe? Ah, so the European component in Morocco relates to more ancient stuff (rather than more recent Vandals and Romans or what have you), so doesn't have much an IBD signal within the frame they are examining. That's an interesting explanation. Populations in North Africa must have been quite structured for some time for this to have been ancient but not to have leaked out much into other North African populations, or become homogenised, but that seems plausible (and I expect their IBD with one another would reflect that). "This study can be criticized for a lack of samples, and using low samples from many regions, but surely we're used to that by now?" Right. 19 from Algeria doesn't begin to cut it; the genetic diversity in Algeria alone would surprise most people, and a detailed study of Maghreb Y-SNPs and aDNA is sorely needed (There are certain hot spots of R1b for example) Their basic conclusions have been obvious to everyone for years, just based on the history of population movements across Gibraltar, in both directions. True, but that need not mean the direction of gene flow was from Jews to gentiles, at least not in all cases. It might actually be the result of the ancestors of these gentiles acting as donors to the Ashkenazi Jewish population at its formative stage, before it experienced strong founder effect and genetic drift. See, once a population goes through a bottleneck and drift it creates clusters in these sorts of analyses at the drop of a hat, but the alleles that make up such clusters might be of very diverse biogeographic origins. It depends on the specifics of each analysis (ie. its design) how strong these clusters are and how they affect the admixed and donor groups. Recent? Doubtful. At least not the majority of it. Well, we now know that even Northern Europeans carry significant levels of Neolithic farmer ancestry, which probably arrived in Europe from Anatolia and surrounds. And yet there's obviously a huge difference between the potentially Near Eastern and North African IBD levels in Northern and Southern Europe. So there's definitely been gene flow from the Near East and North Africa into Europe after the Neolithic. The RFMix table you posted doesn't contradict that. I know, that's why I said not the majority of it. Overall MENA admix in the RFMix table is not that different between Southern and Northern Europe, and since Neolithic farmer ancestry is already higher in the south, there can't be more than a small amount that's recent. Also as you said there's no mention of any dates. A little of it might be from empires and the slave trade, but most is probably from Bronze Age people like Bell Beaker, Minoan, Etruscan, Phoenician.